How does someone shouting into the microphone, “Dear s--- Koreans whom I hate the most in the world, how are you?” make you feel? A civilized reaction would be to call the police, file complaints, or request a reasonable conversation about how we should all live together. One gut feeling for many people, of course, would be to get in the xenophobic jerks’ faces for a shouting match, or something more violent. “Counters” is a documentary about a civic group of the same name in Japan, who fought against xenophobia that spread like wildfire across the country after 2013, and one hot-headed former gangster who leads the way. Takahashi, as his colleagues put it, is someone who is needed, but would turn the whole world into a mess if everyone was like him. His fight is against the group of people called “Zaitokukai,” whose full Japanese name can be translated into “association of citizens against the special privileges of the Zainichi” -- Zainichi referring to Japanese people of Korean heritage. Korea was a Japanese colony from 1910-45, and many Korean people moved to the eastern archipelago to make a living. When Korea was liberated, however, the Japanese government soon found out that their laws on foreign nationals did not apply to Koreans, whose nationality had been Japanese up until that point. A special law legislated in 1991 grants those who had lived in Japan since before Aug. 15, 1945 -- the day of Korea’s independence -- and their descendants legal status, including to stay permanently in Japan. The measure, taken to ensure the de facto Japanese families were not penalized by their status on paper, prompted the Zaitokukai to claim the Zainichi were enjoying unfair and undue privileges. 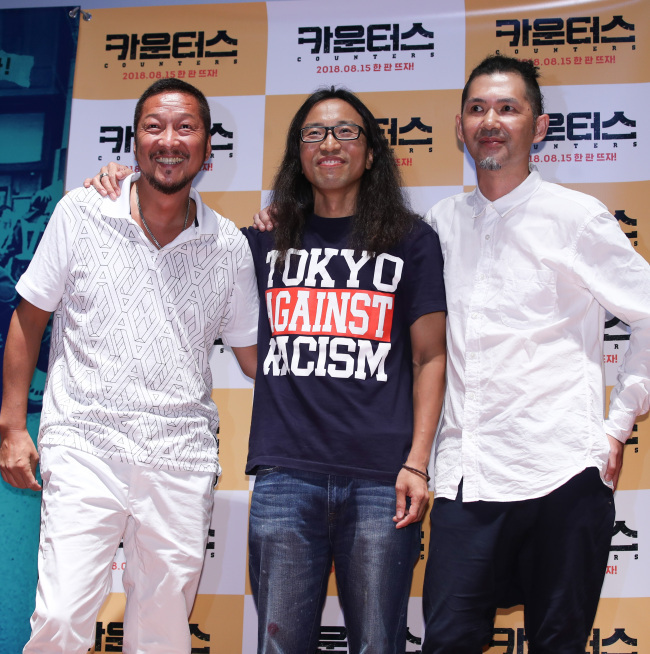 The film follows the Counters, a group of Japan-based civil activists trying to stop the xenophobic protests. It takes many approaches, including education for students, talking to the xenophobic group, but on the center stage taking the heat is Takahashi’s “Ohtokogumi,” or “group of men,” bumping heads with xenophobes in radical protests, often getting themselves arrested in the process. Takahashi, in bitter irony, had been a xenophobe himself as part of the ultra-right wing. He got into an online squabble with the Counters’ Daisuke Ito, which led to an offline meeting and nearly a fistfight, before conversation brought him to his senses. Takahashi, who passed away in April, prided himself in being ultra-right to his dying day. But it was not a matter of left or right that connected him with his colleagues: It was the will to fight injustice. “If you ask me if I’m right-wing or left-, I’d say close to left. But there are many who oppose hate speech that define themselves as right. Right or left doesn’t really matter in Counters,” said Ito, after the premier of the movie in Seoul on Wednesday. Director Lee Il-ha is on both sides of the camera to cover both sides to the story. The in-depth interviews with the Zaitokukai founder -- whose assumed name is Makoto Sakurai -- shows the logic behind the hate speech and xenophobia. What is more chilling about the rambles of a middle-aged man who shudders with discontent over anyone not of pure Japanese blood is the pure hatred of the children who have no reason to hate Zainichi other than that they had been taught to do so. A scene in the documentary shows a middle school girl -- whose father is an avid supporter of Zaitokukai -- uttering the aforementioned “s--- Koreans” line, after which she goes on to cheerfully warn about an impending “massacre” in the Koreatown. The scene shows that discrimination and hatred have no rhyme or reason, and how such loathing affects the younger generation. The documentary opens in local theaters on Aug. 15.